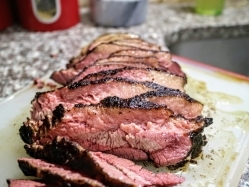 The result here is tender, melt in your mouth brisket. The long cook time and the low temperate result in the juiciest brisket ever. The rub is heavy on the pepper, so it has a nice bite to it, and is totally delicious. Definitely serve this at your next get together if you want to impress! NOTE: To finish in the smoker, add 3 hours to total recipe time. 53 hours total. Combine salt, pepper, and pink salt. Mix thoroughly. Rub brisket liberally with seasoning. Place in vacuum bag, add liquid smoke if desired, and drop into pre-heated water bath. Cook for 50 hours. After 50 hours, remove brisket from water bath and place in a bowl of ice water for 30 minutes, changing ice once if necessary. Remove brisket from bag, pat dry, and add additional rub as necessary. Slice against the grain, and enjoy!